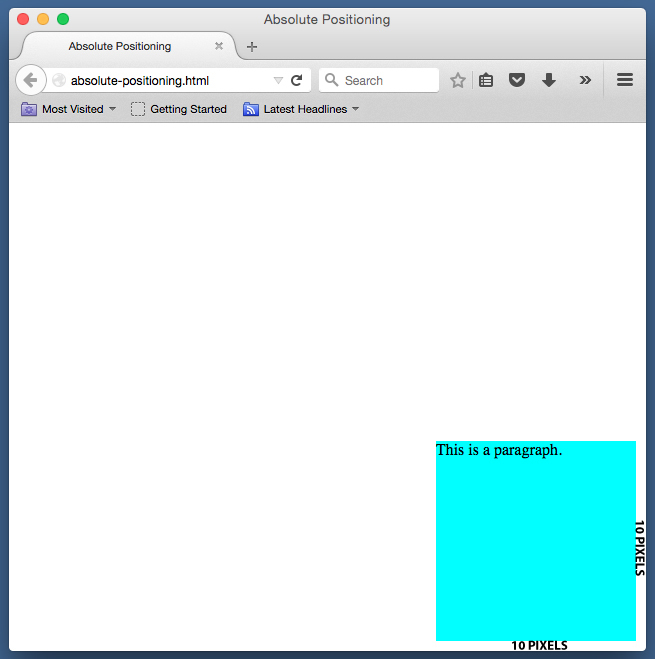 In this article, we're going to learn about absolute positioning in CSS. Absolute positioning is a CSS layout technique that allows you to move an element to a precise location by supplying values known as offsets. Here, I am using absolute positioning to place the paragraph 53 pixels away from the left edge and 107 pixels away from the top edge of the browser's viewport. This was done by adding a left offset of 53 pixels, and a top offset of 107 pixels. Let's see how this works by creating our own example. Copy the code below and save it as an HTML document. What we have here is a basic html page that contains a heading, followed by a paragraph, followed by another heading. And if you take a look at the head element, you will see that there is a style sheet that contains a style rule for the h1 element that sets the margins to 0 and the background color to blue. 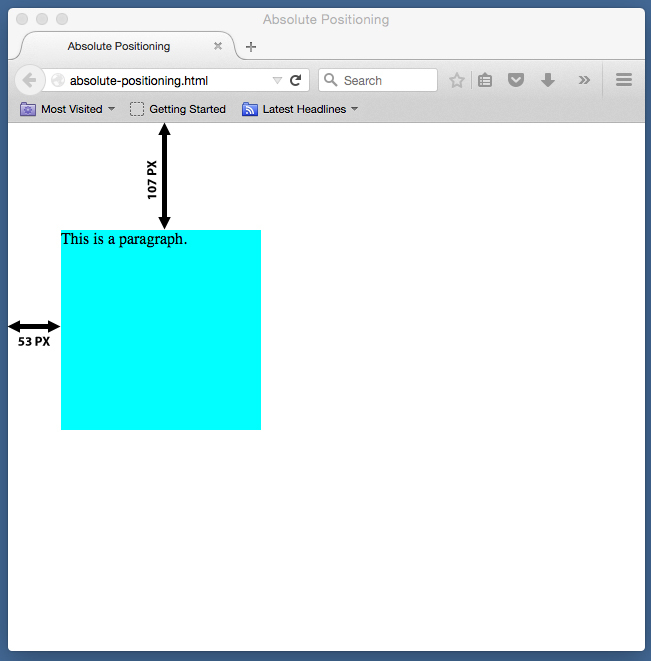 NOTE: The existing margins that you see are from the default html, body, and paragraph margins. But the h1 elements themselves have 0 margins. Now let's go ahead and create a style rule for the paragraph so that we can position it absolutely. To do that, we use the CSS position property and give it a value of absolute. Other values are static, fixed, and relative, but we won't talk about those in this lesson. We've just specified a position of absolute for the paragraph style rule, but we haven't added any offsets yet. The offsets are what will change the element's position. We'll add that later. For now, save the document and refresh your browser. Basically, an element that's taken out of the normal flow will still be visible, but will be ignored by the other elements that still flow normally. That's why the headings are now adjacent to each other. We still see the paragraph, but the headings that used to surround it are now ignoring the space that the paragraph is supposed to be taking up, because to them, the paragraph is no longer part of the normal flow. So remember: absolutely positioned elements are taken out of the normal flow. And now let's move on to offsets. 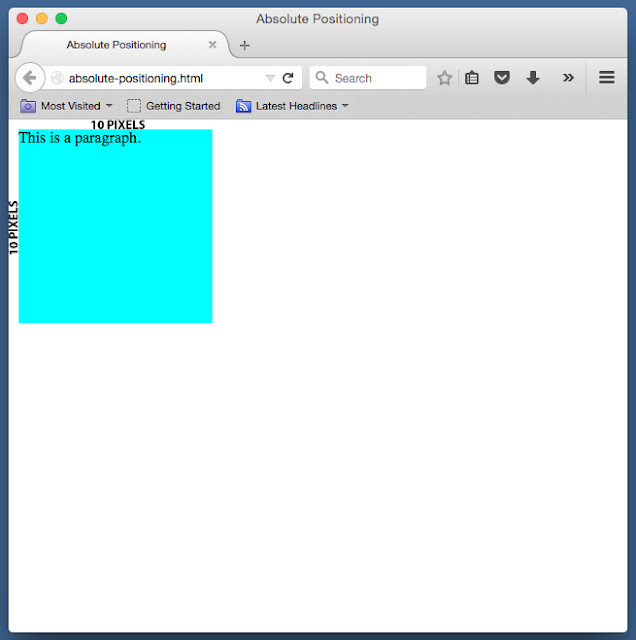 Here, I've specified a content area of 200px by 200px, a background color of aqua, and 0 margins and padding. I'm adding these because I want the paragraph to visually stand out more in order to better illustrate the paragraph's position. The effect here is that the left edge of the paragraph will be 10 pixels away from the left edge of the browser's viewport, and the top edge of the paragraph will be 10 pixels away from the top edge of the browser's viewport. NOTE: The offset takes into account the BOX edge of the absolutely positioned INNER element. In this case, the inner element is the paragraph. But since the paragraph has no margins, padding, and borders, then the CONTENT edge is the same as the box edge (see CSS Box Model for a review on this). Now what happens if we change the offset properties to bottom and right. You can also specify an offset of 0. Now keep in mind that the offset for each side is still 10 pixels each, and that the increase in space is simply a result of the added margins. 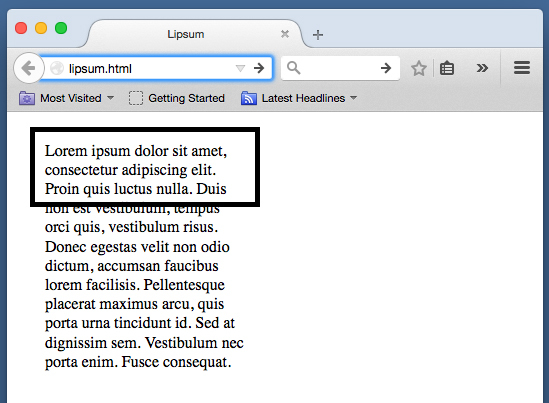 Preview your webpage after adding these new style rules, and you'll see that the paragraph stays in the same place. Also try adding width, height, and borders. You'll see that the paragraph's position will remain unchanged. So right now, we see that the paragraph is positioning itself based only on the viewport's edges. None of its other ancestor elements (html and body) are influencing its position whatsoever. The reason for this is because none of the paragraph's ancestors are positioned. In other words, none of them have a position property in their style rules that says absolute, relative or fixed (note that I am intentionally omitting the value of static). And if it is the case that a positioned element has no other positioned ancestors, then the positioned element positions itself based on the viewport. NOTE: A static position is the default. It is the normal way in which elements are positioned. Saying that an element's position is static is the same as saying that an element is NOT positioned. So what happens if a positioned element has ancestors that are also positioned? In those cases, the position of the inner element will NOT be based on the viewport. Instead, its position will be based on the positioned ancestor that is NEAREST to it (nearest in the HTML code, not nearest in terms of layout position). And we'll take a look at some examples of that in a future post. When you're using CSS to specify margin, padding, border, width and height values for your elements, you might run into some issues where the browser doesn't seem to be calculating the values correctly. Sometimes, there might be some actual errors in your code, but in some cases, your code is correct, but the results displayed in the browser are not quite what you expected. For example, you've specified a width of 400 pixels for your paragraph, but when you measured it, it shows a value of 420 pixels instead. Or you're expecting two elements to have a 20 pixel margin space in between them, but the browser only adds 10 pixels. In cases like these, it's important that you have an understanding of what is called the CSS Box Model. pulvinar venenatis posuere. Sed eu ullamcorper enim, a eleifend urna. Now try to imagine that this paragraph is contained inside a box. This is something that your browser will do for each element in your web page's document tree. It puts each element inside a box, and this box is used to determine how the element is laid out. The size of the box is based on the content of the element, along with any values specified for the width, height, margins, paddings, and borders. It's important to note that even if you don't put any borders, each element is always going to have its own box - it could be a box made up of just the content or a box that includes margins and paddings. But whatever the case, there will always be a box, even if you don't see it. Now in order to make sure that these boxes are rendered correctly, there needs to be a set of rules that the browser can follow in order to be consistent. And that is why the CSS box model was created. The CSS box model provides a standard model that browsers should follow when generating these boxes that determine how the elements in your document are laid out. It provides a set of rules as to how the elements of your document will interact with each other based on each element's content width, content height, margins, paddings, and borders. We see that the box is made up of different areas. Inside, we have the CONTENT AREA, whose dimensions are made up of the content width and content height. The content area, as the term implies, is the space for the element's content. In paragraphs, for example, the content area is the space for the words in the paragraph. In section elements, the content area would be the space for the headings, paragraphs, and all other elements that can be placed insides sections. 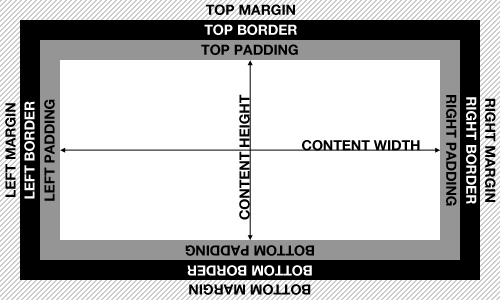 Surrounding the edges of the content area would be the PADDING AREA, which is made up of the top, bottom, left, and right paddings. Then around the padding area, we have the BORDER AREA, also consisting of top, bottom, left, and right segments. And finally, the outermost part is the MARGIN AREA, which can also be found on all sides. It's important to note that the CSS borders do not always show the exact size of the box. As you can see, the margins are OUTSIDE of the borders. And because margins are transparent, the box can appear smaller than it actually is. Unless you have a margin of 0 on all sides, the actual box is always bigger than the area illustrated by the CSS borders. I'd also like to point out that the CSS specification uses the terms content BOX, padding BOX, border BOX, and margin BOX. But to avoid confusion in this article, I'll be using the word BOX to refer to the ENTIRE box, and AREA to refer to the different parts inside it - content AREA, padding AREA, border AREA, and margin AREA. So what would be the total width of the paragraph's box? Will it be 400 pixels INCLUDING the left and right margins? Or do we have to add the margin values to the existing width value? These are the types of questions that the CSS box model tries to address. So what does the CSS box model say? According to the CSS box model, width and height refer only to content width and content height. So while the width of the content width is 400 pixels, the width of the actual BOX will be: 400 (content width) + 15 (left margin) + 25 (right margin) + any default left and right paddings that the browser may have added. So our total box width is 470 pixels. In some cases, you may have element content that doesn't fit inside the box. In this example, we are explicitly setting both a content width (200 pixels) and a content height (50 pixels). Usually, the paragraph's box will just automatically adjust its height to fit the content. 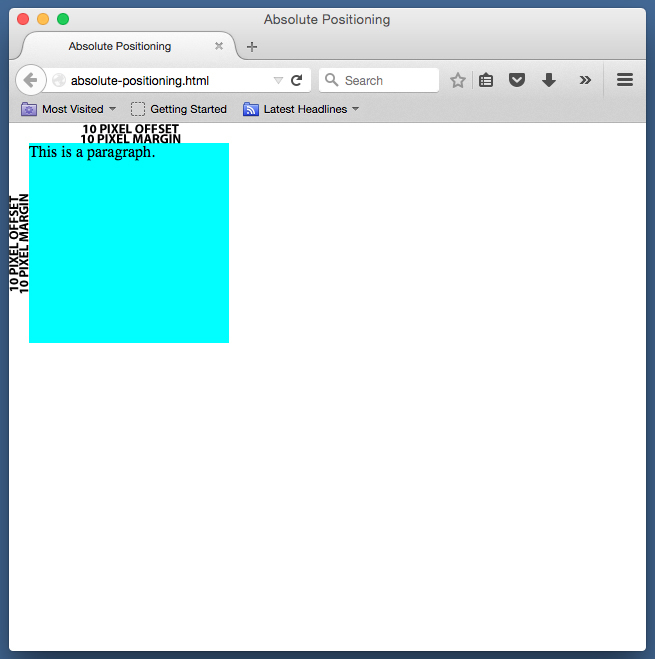 But here, we're constraining it to 50 pixels. If the paragraph only has 15 or so medium-length words, then the 200 by 50 pixel content area should be enough. But if we have too much, then the content begins to flow out of the box. But clearly, the content of the paragraph is too much to fit inside the box, so we see the overflow spill beyond it. To control the overflow, we can use the overflow property in CSS. By default, this has a value of visible, which means that any overflow will be visible. The other values are hidden (which will hide the overflow) and scroll (which hides the overflow, but adds a scroll bar so we can scroll down to see more). So Paragraph 1 with a class of p1 comes first, and then Paragraph 2 with a class of p2 is right below it. This means that the bottom margin of the first paragraph comes in contact with the top margin of the second paragraph. So in this example, the vertical margin space between the 2 paragraphs will be 50 pixels, because that is the larger margin between the 2. What we have here is a div element, which is a generic container element that can be used to group other elements together, mostly for CSS styling and layout purposes. Inside this div element is a paragraph element. So in this example, the div is the parent element, and the p is the child element. There will often be instances when the margins of the parent and the child will come in contact with each other. And when that happens, the CSS box model provides rules on how to handle those instances. First, we see that I have styled the html and the body element to have margins and paddings of 0. The reason is that some browsers might add non-zero values to these properties, and they can interfere with the outcome of this example. So to avoid that, I am resetting their values back to 0. Now let's look at the div's style. We see that the div has a content area of 200 by 100 pixels. As for the paragraph, we're NOT specifying width and height values. This means that the paragraph will just conform itself to the size of the div. We don't have to worry about any overflow since our paragraph has very few words, and we're not specifying exceedingly large margins, paddings, and borders. Next, we see that the div has 0 padding on all sides and no borders. However, it does have a 15 pixel margin on each side. Later on, we'll see how its top margin will interact with the top margin of the paragraph inside it. As for the paragraph, there are also no paddings and borders, but there is a 15 pixel margin on each side. And lastly, for both elements, I've added background colors to better illustrate how the margins will interact with each other. Remember that an element's background color area includes the paddings, but not the margins (which are transparent). The div is on the left, and the paragraph is on the right. The margins are denoted using the diagonal lines. Next, let's show the illustration where the paragraph is inside the div. Here, we'll see that their top, left, and right margins come in contact with each other. The left edge of the div's content area (which is blue) is 15 pixels away from the left edge of the browser's display window. The left edge of the paragraph's content area (which is aqua) is 15 pixels away from the left edge of the div's content area. The right edge of the paragraph's content area is 15 pixels away from the right edge of the div's content area (numbers 1 to 3 behave this way, because horizontal margins do not collapse). The 15 pixel space in between the div's horizontal edges and the paragraph's horizontal edges shows the divs blue background colour. This is because the space is created by the paragraph's margin, and margins are transparent. Therefore, the div's background color will show through. The collapsed margin in number five will be 15 pixels, because both original top margins are 15 pixels. This collapsed margin will create a space in between the top edge of the div's content area and the top edge of the browser's display window. The CSS box model is not always intuitive, and can often be quite confusing, so take a moment to analyze what you just read, and then let's move on to another example. Now that you're ready to move on, let's give our previous example a slight modification. What happens if we add a border to the div element? The div now has a border. There is a 15 pixel margin in between the div's border and the top of the browser's display window. There is now a 15 pixel making in between the top edge of the paragraph's content area, and the top edge of the div's content area. This new vertical area results in the div's blue background showing through that new 15 pixel space created by the paragraph's uncollapsed top margin. I'd also like to point out that if you added a top padding to the div instead of a border, you will have the same effect. Adding padding to the div will also serve as a divider between the div's margins and the paragraph's margins. So in that case, the vertical margins will also NOT collapse. The same can be said even if you added a transparent border instead of a colored one. At this point, I would like to end this article. There are a lot more complex examples that can illustrate how the CSS box model works, but as an introductory lesson, this will suffice. We may come across more examples in future lessons.